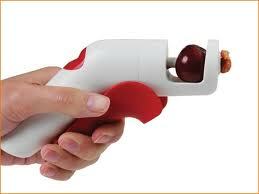 This hand-held cherry pitter gets rid of cherry and olive pits in seconds. Just insert a cherry or olive into the nook, pull the trigger, and watch the pit pop right out! The Quickpit removes pits from cherries and olives with ease. Hold over a bowl or trash and squeeze handle for perfectly pitted fruit. It is one hand operation and streamlined design with no exposed blades or sharp edges.